Glen Neath and David Rosenberg's previous collaboration, Ring, used darkness and surround sound to explore sinister group dynamics. This time, they switch off the lights, put the audience in a shipping container and try to scare them. It's a brutish use of sophisticated technology, veering close to a simplistic thrill-ride that relies heavily on the disorientating effect of the headphones to poke at a primal fear of the dark. The brilliance remains in the way that they build an entire fake world through the script and sound effects. It is as if there are actors present, moving about, whispering and banging on the table: the container becomes a portal to a supernatural world. Yet it does little to go beyond the scares – they are both jump and psychological but the short duration and concentration of events limits its impact. Without the plot and characters of Ring, the impact is direct and thuggish. It is completely immersive and conjures an atmosphere of horror, but it reduces the theatre experience to little more than a brief entertaining glimpse of how the mind can play tricks. 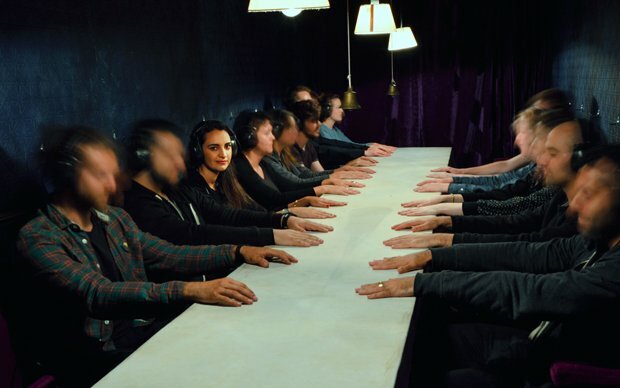 Glen Neath and David Rosenberg present a séance inside a completely dark shipping container. Probably not for the faint-hearted.